Here at the Shack we are forever in search of useful information that our readers can use to improve their lives. Having once been subject to vagaries and insults of cubicle life we are well aware that annoying people often populate the world around us. We once sat near a person who thought that the proper way to speak on the telephone was to bellow, guffaw and shriek. That might be fine for a zoo, but the workplace wasn’t. 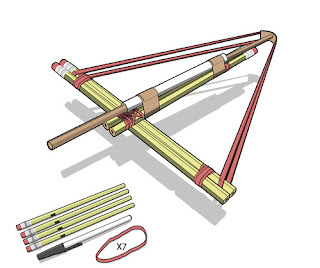 So we are pleased to share with you a link to the fine folks at Gizmodo who can provide complete instruction on how to build the fine crossbow in the adjoining illustration. Had we known about this we might have chosen to use it to discourage the guffaws and shrieks coming from those cubicles around us.